[%pageBreakSettings nobreak=true] My days of being a smug foodie parent were short-lived. 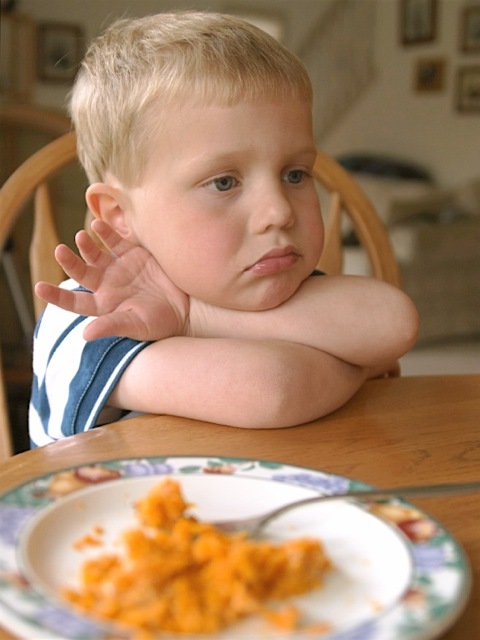 I remember the meal all too well: a relative used the phrase “picky eater” when my then two-year-old daughter wouldn’t eat the (dry, tasteless) turkey. Before I could stop myself, I indulged in disclosing what the tyke had devoured for breakfast: a frittata with leeks, chanterelles, and goat cheese. Picky eater, eh? Take that, and your Jell-O salad, too. Hubris. I’ve pretty much been eating huge plates of crow ever since. I knew I had it coming, but I didn’t foresee how painful the demise would be. Each of my children hit an age when I could no longer brag about their epicurean tastes; begging for squash and salmon became hazy memories of a distant past. Just when I thought I couldn’t take any more, my children started canceling each other out. She likes burritos with beans, no cheese. He won’t eat beans, only cheese. She scrapes the cheese off pizza. He wants the cheese without the sauce. She won’t eat meat. He pleads for hot dogs. I told myself early on that I wouldn’t be a short-order cook. For a while, I forged ahead, making the food I liked — Indian curries, pad Thai, pasta puttanesca — only to watch the kids prod and push their food around their plates, then tell me they were hungry. If there is one thing most moms I know can’t abide, it is hungry children; it’s our job to feed them, no matter how exasperating they might be. The trick, of course, is finding the right balance between cooking the foods you like to eat and the foods they are willing to eat, all of which are healthy, tasty, and quick to prepare. We lead busy lives, and no matter how much you like to cook, there are times when making dinner becomes an absolute chore. While it’s great to have a meal that pleases everyone at the table, pizza and French toast more than once a week — and even that is pushing it — makes me whine and beat my fists on the table. My current compromise for dinner is to make something that the kids will eat unadulterated and that satisfies me in the embellishments. Examples? Usually every week we have some variation on tacos. Everyone eats rice and corn tortillas; Miss Eleven will also eat beans, while Sir Seven makes tacos out of cheese and rice, and my husband — Mr. I’ll Eat Anything You’re Making — and I will fill tortillas with sautéed onions and poblano chiles, chipotle chicken, or grilled fish and cabbage slaw. Another weekly stand-by is pasta. Both children will eat platefuls of noodles tossed in olive oil and salt, supplemented by a glass of milk (protein) and a fresh vegetable or fruit. That same plate of plain fettucine becomes an empty canvas for whatever I might be craving. The intention, of course, is that at some point the children will say, “Gee, Mom, that sure looks good. May I please have some of that instead of this tasteless, starchy food?” After all, that’s what happened in Bread and Jam for Frances. Sure, real badgers don’t wear clothes and carry their lunch in pails. But there's no doubt in my mind that that story was based on real life and written by real parents. p(bio). Carrie Floyd is the food editor of Culinate.